Kansas City Lowball is a variant of draw poker in which the standard hand rankings are reversed. Draw poker is so-called because players are given the opportunity to discard and replace any, all or none of their cards at a certain point during the game. Reversing hand strengths can be an odd concept for new players so there’s a definite benefit in taking in a few practice hands first. Also known as Deuce to Seven Low, the aim of Kansas City Lowball is to create the strongest five card hand according to specific Lowball rankings. Pairs are bad and any hand without a pair will beat a hand with one. 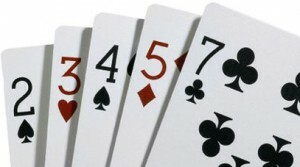 Aces are high, straights and flushes are also bad meaning that the strongest possible hand is 2, 3, 4, 5, 7. Kansas City Lowball is generally played with blinds and so the two players to the left of the dealer will bet the small blind and big blind respectively. Assuming more than one player remains in the game, the ‘draw’ round now takes place. Kansas City Lowball is distinguished by having just one ‘draw’ round. Each player can now choose to discard and replace any or all of their cards to try and make a stronger one. A final round of betting now follows after which the showdown takes place and the remaining hands are compared. As with other Lowball games, drawing more than one card is not particularly common because of the likelihood of making a pair and/or drawing a high card. Specifically, Kansas City Lowball uses the same hand ranking chart as Deuce To Seven Triple Draw (2-7) and you can find the chart by using the link at the top of the page.